If you’re wondering how so many of your neighbours have such brilliant looking lawns when you never see them out tending the grass, we’re here to let you in on a little secret. They most likely have an artificial grass lawn. More and more people are choosing this affordable alternative as there are so many benefits. If you choose to deck out your garden or front lawn with artificial grass, you can have a beautiful looking area with none of the work! Unlike natural grass, artificial grass needs no mowing, weeding, cutting or any special attention once it’s installed. Artificial grass is truly no fuss, leaving you time and energy to do the things you really love in life. 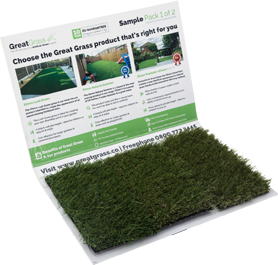 As leading suppliers of artificial grass in the UK, we have a wide range of different types of grass depending on your requirements. Included in our variety we have budget grass, natural spring grass and lush green grass. All with a ten year guarantee. Most importantly, our artificial grass is extremely hard-wearing, meaning you won’t have to worry about wear and tear. This is especially useful if you have children or pets. And it means you can have as many garden parties as you want without worrying about your lawn! Our Great Grass is the best artificial grass you can find, and we do our best to keep our prices as competitive as possible. Contact us today to get started on creating your perfect lawn 0161 685 0071.